Digi-Kits for Minolta There are 4 products. Fits: Minolta DiMAGE S304, S404 & S414. A "Digi-Kit" includes everything you need to connect your digital camera to your telescope in one click.. so long as you have a suitable eyepiece that is compatible with our Digital T Ring #1! Fits: Minolta DiMAGE Z3, Z5 & Z6. A "Digi-Kit" includes everything you need to connect your digital camera to your telescope in one click.. so long as you have a suitable eyepiece that is compatible with our Digital T Ring #1! Fits: Minolta DiMAGE Z20. 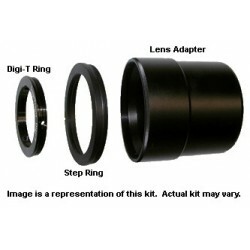 A "Digi-Kit" includes everything you need to connect your digital camera to your telescope in one click.. so long as you have a suitable eyepiece that is compatible with our Digital T Ring #1!